My friend and fellow foodie Fatmah from F. Scribbles and I decided to start a Foodie Series on both of our blogs. We will both feature the same people but will post at different times. 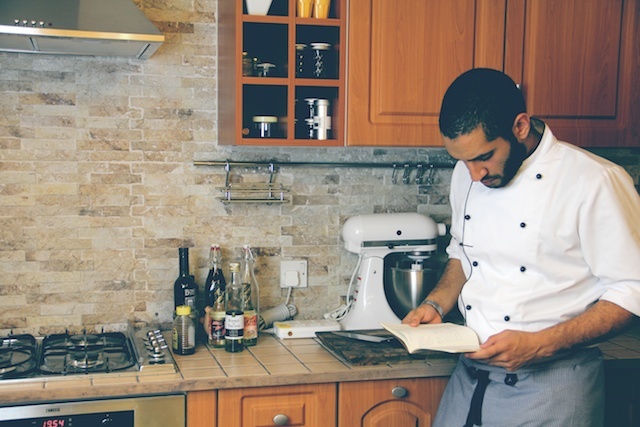 Our first feature is Faisal AlNashmi, commonly known as Zubaneen, an aspiring chef and a fresh graduate. I have been following him on Instagram for a while now and what caught my attention is how he recreates traditional dishes in a new and refreshing way, as well his incredible food photography! We asked him 8 foodie questions and below you’ll find his enthusiastic responses. 1. What do you do on a day to day basis? I’m currently a freelance cook. My day usually starts at 9 am at the Sultan Center, buying ingredients for the dish I will be testing in the kitchen that day. When I get home and into the main kitchen, this is where the fun begins; sprinkles of flour and smudges of oil all over the countertop. Our cook prays to God that some day I leave this child play. My main goal is to plate the dish when lunch is first served upon my Dad’s arrival. I take it to our garden and start shooting to upload on Instagram (my best friend), then get comments while my family each get a bite. The rest of the day? Well, going through piles of pictures and editing for next day’s upload. 2. When did you discover that you’re a foodie? Everyone loves asking this question, yet I never get tired of answering. When my family and I moved to London in 2005, it took me a while to adapt to the new place and environment. So for the next two years, I spent most weekend at home with BBC Food switched on 24/7, until I was eager enough to step into the kitchen and try my first dish. I still remember holding a whole chicken disgusted by its smell and cold raw loose skin. A little olive oil, orange zest, garlic, rosemary and chopped veggies then locked in the oven. Success is what I smelt, the aroma just perfumed our whole apartment and drools slid down my lips. Experimenting with food was something I was proud of. Trying to recreate whatever I see and taste from memory helped broaden my culinary knowledge. With this knowledge, came a vast list of close-to-destruction dishes, being very close to burning the kitchen, slicing fingers and eating uncooked chicken. However, I followed this cliched theory of “practice makes perfect”, although I’m a long way from perfection. I know this might sound weird coming from a foodie but whenever I’m visiting a new place I’d like all my restaurant experiences to be successful. Therefore, going to a top- notch one would be satisfying. However, if all that is served are decorative plates with a spoonful placed in the middle and then act full in front of affluent customers, I’d go for the local restaurant later on, once the tucked shirt and belt phase is over and done with. See that’s playing it clever, hitting two birds with one stone. 4. Your most memorable meal? Back in my obese days, eating fat Kit Kat-like chunks of slow cooked beef was something I craved for days. We used to drive all the way to Fahaheel just to get handfuls of oily “Goat Mendi” for lunch and I thank my cholesterol levels for that. So, a memorable dish for me has to consist of large quantities of fat which my Grandmother was really good at. Four hour cooked sheep hooves, Karaeen in the Kuwaiti dialect, in soaked bread,Tashreeb, is a dish I will remember forever. The flavor still lingers around my tongue and eating it causes all senses to sing in harmony. This would be the dish to solve world peace! Hot soaked bread with fat and meat all in one heaping spoon bite, not thinking about calories shoved in my mouth. It literally is an eat till you die dish, but it will make sure you die a happy man. 5. What is your favorite kitchen tool? 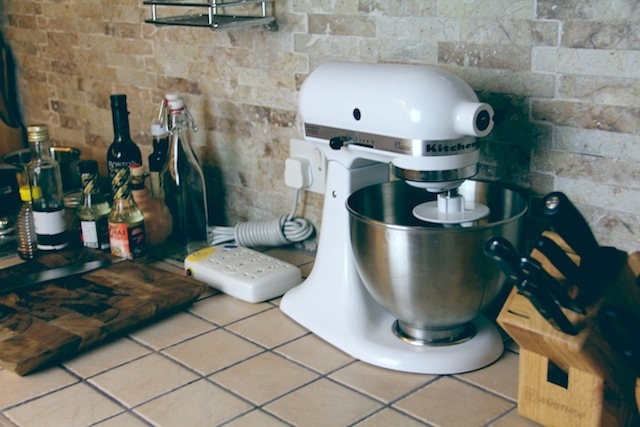 The Ferrari of all standmixers, the tool that weighs a ton, the retro design, the KitchenAid Stand Mixer. My life. The first thing that comes to mind is Melenzane. A true Italian creation with fresh flavors exploding with every bite. 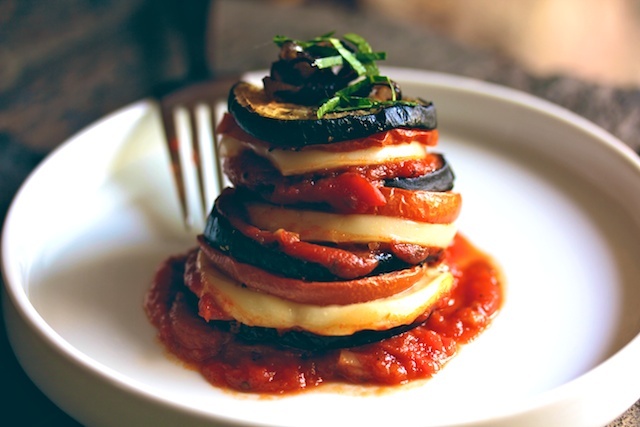 Layers of baked tomato and aubergine with sliced fresh mozzarella and caramelized onion on top just for the fun of it. Preheat your oven to 180C. Slice the aubergine and tomatoes to about 1 cm thickness then place on a baking tray. Drizzle some olive oil over the cut vegetables and sprinkle some freshly crushed black pepper and salt then bake until vegetables start to slightly wrinkle. To make the marinara sauce, chop the 3 tomatoes and cook with a tablespoon of olive oil in a pan. Chop the garlic cloves and add. Cook until tomatoes turn soft, then add salt, pepper, sugar and water. Once the marinara starts to simmer, add the paste and cook on medium/low heat until the sauce reduces and thickens. In another pan, melt some butter and cook sliced onions on low heat until it caramelize. To layer: Start with the baked aubergine, marinara sauce, mozzarella and then the baked tomato, and repeat. Bake in the oven until the cheese melts. Garnish with the caramelized onions and chopped basil. Serve hot. 7. Submit a video of you in action in the kitchen! 8. Can you share a food/cooking tip with us? This might sound boring, lame and repetitive but trust me it is key to whoever wants to succeed in anything in life, not just cooking. Lets take the concept of making macarons. The first day I made macarons, they came out of the oven as burnt turds stuck on my wax paper. I knew this wasn’t right, the next day I used another recipe and another one on the third day. Day by day, what first looked like a turd started to slowly look like a macaron. On the 6th day, I placed my baking tray in the oven and watched closely until the moment when they started to have that bubbly bottom feet! I cheered alone in the kitchen, getting the million dollar sensation, until I realized the recipe wasn’t noted down. It was something I was proud of, putting my head into something and having that great determination of perfecting what you want is rewarding. No matter how long you think about doing something, you won’t get it done unless you try. Determination is key! Thank you Faisal for agreeing to participate in our Foodie Series and wish you the best of luck! To follow his mouth watering creations and beautiful photography make sure you follow him on Instagram @ZubaBar and Twitter @Zubaneen. This entry was posted in The Foodie Series and tagged aspiring chef, Faisal AlNashmi, foodie, kuwait, local, profile, series, Zuba bar, zubaneen by Budour. Bookmark the permalink. Amazing work mashallah! All Kuwaiti citezens should have your attitude towards anyhthing they believe in! Truly one of the most talented men I have ever heard of. Keep up your great work, and we’re always around to have a taste of your sensational dishes! Mashallah, it seems like he has such a positive outlook on life!